Not Just Patriotic, U.S. Manufacturing May Be Smart The incentives are stacking up in favor of making things at home. As General Electric discovered in its Appliance Park in Louisville, Ky., big things can happen when marketers and designers talk to assembly line operators. 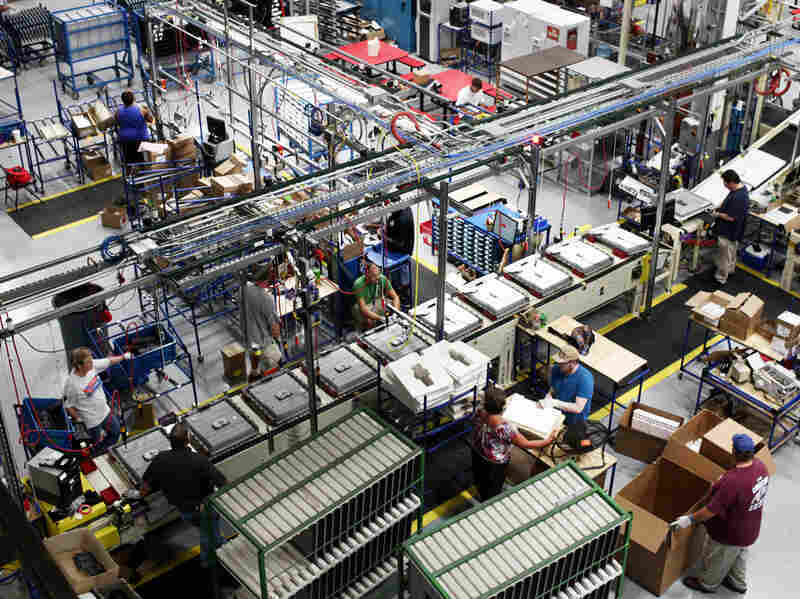 Collaboration is one piece of how U.S. factories are becoming more efficient — and enticing. General Electric's Appliance Park has been in Louisville, Ky., since 1951. But it's putting new power behind its U.S. production. The advantages to making products in the U.S. are starting to stack up — and companies are taking notice. Among them are Apple, which announced Thursday it plans to start producing some of its Mac computers here instead of in China, and General Electric, which is making big investments at home. It's not just a matter of publicity, either. As the December issue of The Atlantic reports, companies are seeing real economic advantages to "insourcing," a reversal of the outsourcing trends that sent U.S. manufacturing overseas. General Electric opened Appliance Park in Louisville, Ky., in 1951, but lately it has been making some changes there. In August, the company announced an $800 million investment in jobs, products and the manufacturing process itself. Back in 2008, Rich Calvaruso gathered his team at Appliance Park and told them they had to rethink the dishwasher. As a "Lean" leader, Calvaruso's job is to figure out how to make things more efficiently. So he asked a team of factory workers, designers and marketers to put their heads together. They managed to cut down the time it takes to build the dishwasher by one-third. The dishwasher's orientation was the key. When it was set up a certain way, operators down the line could do their work without spending time manipulating the washer itself. Even though it now takes fewer people to make that dishwasher, not a single person was laid off. Calvaruso tells Guy Raz, host of weekends on All Things Considered, that those employees were freed up to work in other parts of the company. Entrepreneur Bayard Winthrop says his hoodies are the best in the world, and that he's making money making them in the U.S. He opened his clothing business, American Giant, in San Francisco in February. He has 10 people in front office and up to 150 in manufacturing, where his entire line — soup to nuts — is made in America. The business was featured in an article in Slate on Tuesday. Two days after that article was published, they were practically sold out, he tells Guy Raz, host of weekends on All Things Considered. So what makes them so special? As noted in Slate, they aren't cheap. A basic sweatshirt is $59. But Winthrop says the secret is in the details — from the fabric to the draw strings, "making sure that each one of those elements of the sweatshirt gets a lot of attention." But they're still making a profit, in part because they've cut out the distribution costs by selling solely online. Winthrop says staying close to the consumer and the manufacturer "was the unlock." "And that gives us ... a lot more investment opportunity to put back into product and service," he says. Winthrop is also confident they'll be able to scale up production as the business grows. "I think there's an awful lot of chatter in the media about the death of American manufacturing. I think we're finding almost exactly the opposite," he says, "that the manufacturing facilities that have made it through the last 30 years — which no doubt have been difficult — have come out the far side stronger and more efficient, with phenomenal people, talented people, efficient people." That process set in motion a company-wide re-evaluation of how GE should operate. The new philosophy was simple: It might make more business sense to have everyone involved in a product work in the same place. That thinking led to a change that couldn't have happened if some workers were in China, others in Mexico and some in the U.S.
GE holds up another example of improved efficiency. The marketing team wanted to eliminate four visible screws to improve the dishwasher's design. A diverse group of workers found a way to do that, making the manufacturing process quicker as a result. With workers in different departments physically sharing the same space, Calvaruso says, these cross-interest conversations can happen more easily. Reporter Charles Fishman, who wrote about Appliance Park in the latest issue of The Atlantic, doesn't think it's a blip. He sees the four-screw story as a metaphor for this insourcing boomlet. "To me the power of the four-screws story is no one ever would have known, in the old method, a year and a half ago, that anybody wanted the screws to disappear," he says, "that they could have been made to disappear, that making the screws go away makes the door cheaper, easier to make and a better product." Fishman says companies are finally seeing the economic advantages of doing things differently. "What I discovered is it's not clear this huge wave of outsourcing was done for really smart, rational business reasons," he says. Companies started moving jobs overseas when they calculated how much cheaper the labor was, Fishman says, but they weren't factoring in other kinds of costs. "This stuff turns out to be really complicated," he says. "And you have to sit down and ask a whole set of questions before you understand that you've been making a mistake for a year, or two years, or four years." One of those factors that businesses are starting to take into account is intellectual property, Fishman says. Specialized technology can make products more competitive, but if they're made overseas, it's easier for others to make knockoffs. Another incentive is energy prices, he says. Manufacturing in the U.S. cuts down on transportation costs. Plus, he says, the factories themselves can run on natural gas, which is cheaper in the U.S.
All of these variables put together make the difference, Fishman says. "I don't think you can say just wages, or just energy prices, or just transportation time," he says. "But when you stack them up, it really gets to be incredible." But U.S. manufacturing jobs aren't exactly erupting in a boom. "There haven't been this few people working in factories in the United States since 1941. There were a third fewer people in the country then," Fishman says. However, the output of the workers that are in the industry is high. "Because of the recession, we're not quite at the highest dollar value the country's ever produced in manufactured goods, but we're very close," he says. And as more companies like GE make big investments in U.S. manufacturing, others could start to follow. Fishman says the U.S. manufacturing industry won't ever look exactly like it used to, but that different kinds of manufacturing will start happening in different places. However, he says, the notion that the U.S. will never make anything again is "dramatically overstated." "I think smart companies will see it isn't an act of patriotism or charity," he says. "It's smart business to make stuff here."